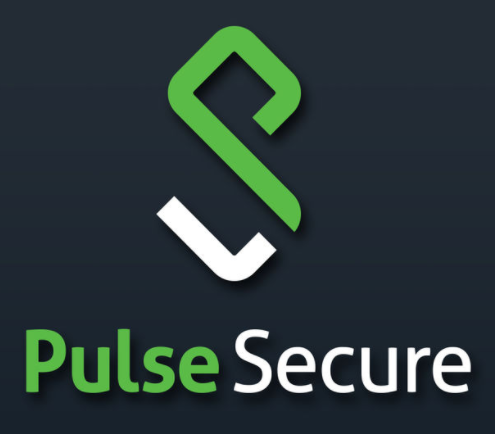 With Pulse Secure you will need to complete the pending request that was left on the system from when you created your CSR. Your certificate authority should have given you an Apache format or Other x509 type of SSL Certificate and Intermediate CA. To install your SSL Certificate into Pulse Secure perform the following. 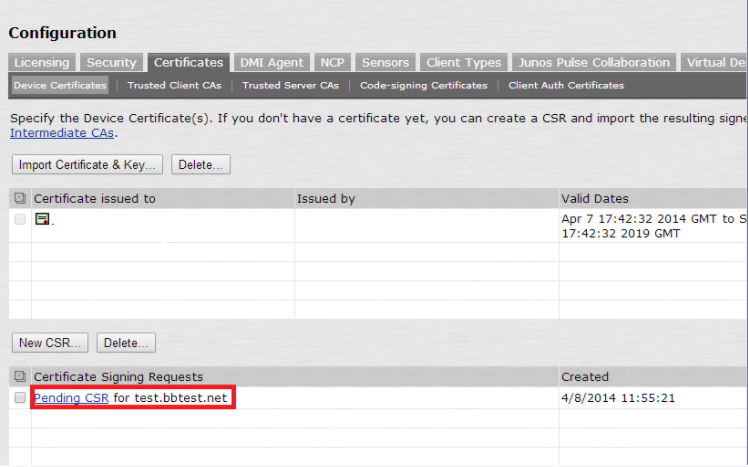 Under Certificate Signing Requests, click the Pending CSR link that corresponds to the signed certificate that you are importing. Under Import signed certificate, click Choose File to navigate and select the location of your new SSL Certificate file. Congrats you have imported your SSL Certificate. Intermediate CA certificates are responsible for helping the chain of trust to all the different browsers that connect to the SSL Certificate and various roots. If your SSL Certificate is trusted on one browser but not the other more than likely it is due to a lack of Intermediate Certificates. Click Browse to specify the location and path of your Intermediate CA file. Congrats you have imported your Intermediate CA. Note: Some Certificate Authorities may give you more than one intermediate. Repeat Step 3: Import the Intermediate CA Certificate to import any additional intermediates. From the device certificate list, double click on the certificate you are replacing. 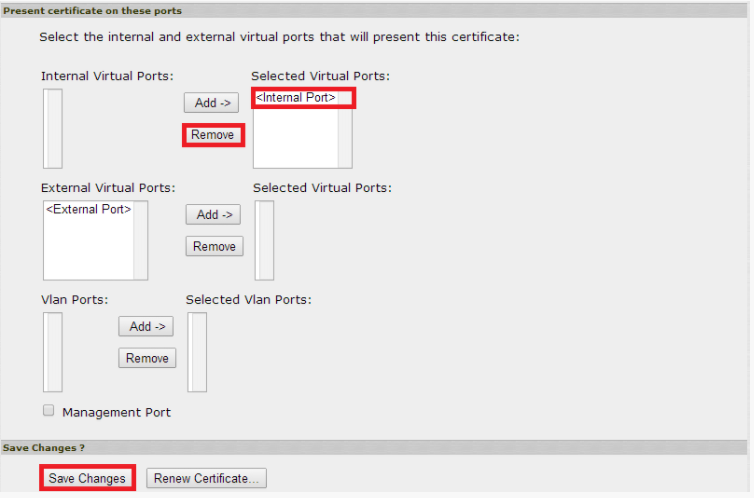 Under the present certificate on these ports remove/unbind the certificate from any ports that it is applied to. Now with the old certificate unbound to the relevant port double click on your new SSL Certificate. 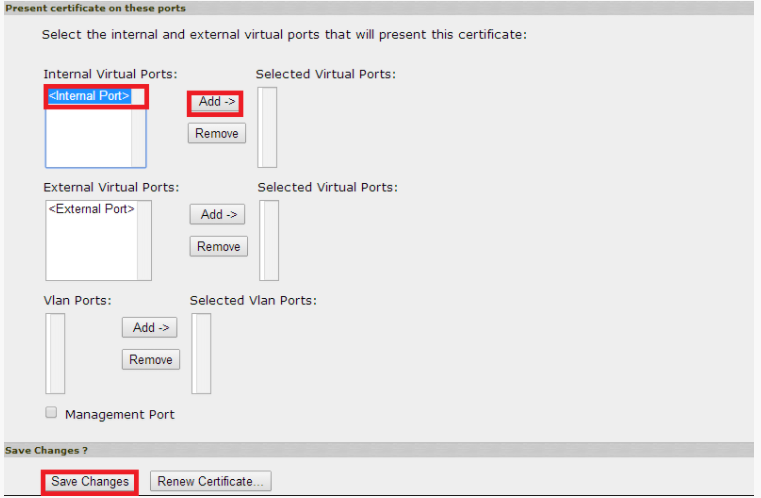 Select the and Add the relevant ports that you used the old certificate on to the new one.